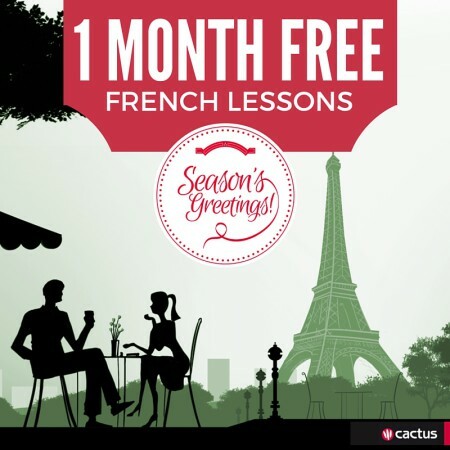 Learn French Online with Cactus and Frantastique! Cactus has partnered with the online French language provider Frantastique to bring French to your PC, tablet and mobile phone. Try Frantastique for free and you will find yourself immersed in the francophone world of la��AIGF, Victor Hugo and his crew. This online course is a personalised 10 minute daily training that is sent directly to your email. It is fun, quick, easy to do and you will find you can parler franA�ais currant rapidement. 10 minutes per day is all you need. You only need to set aside around 10 minutes to complete your lesson. The corrections follow immediately. You can complete your Gymglish lesson whenever and wherever you like! Frantastique’s artificial intelligence engine builds a new lesson based on your needs, your topic requests, and your level. Every day, you’ll get citations with different accents, film clips, songs and more to help you explore the richness of French culture around the world. From France to Canada, you will hear it all. Just tick the box next to the terms and expressions which you’d like to learn more about. They’ll be explained to you in your correction e-mail, and then you’ll receive more information and reminders about this new vocabulary in a timely fashion in future lessons. Our Artificial Intelligence system chooses your daily episode based on your level of French and the professional vocabulary areas and other topics you have selected. The stories help you to improve your English vocabulary, learn useful expressions, and feel more comfortable speaking French. Frantastique keeps track of your progress. To make sure that you commit your new knowledge to your long-term memory, we build a personalized revision program which reviews all the points covered in a timely manner. The French you learn will stick! Test Frantastique now and you will begin to parler franA�ais currant rapidement!